Disagreement and conflict occur commonly in social life and considerably affect our well-being and productivity. Such negative interactions are rarely explicitly declared and recorded and this makes them hard for scientists to study. I worked with Ruth García-Gavilanes and Taha Yasseri from the Oxford Internet Institute to overcome this challenge. We did that by investigating the patterns in the timing and configuration of contributions to a large online collaboration community. We analyzed sequences of reverts of contributions to Wikipedia, the largest online encyclopedia, and investigated how often and how fast they occur compared to a null model that randomizes the order of actions to remove any systematic clustering. We found evidence that individuals systematically attack the same person and attack back their attacker; both of these interactions occur at a faster response rate than expected. We also established that individuals come to defend an attack victim but we did not find evidence that attack victims “pay it forward” or that attackers collude to attack the same individual. 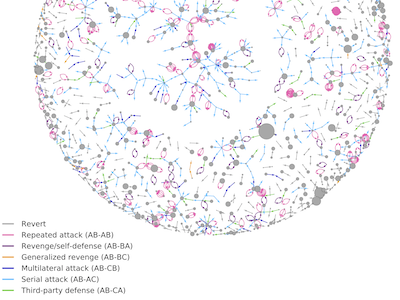 We further found that high-status contributors are more likely to attack many others serially, status equals are more likely to revenge attacks back, while attacks by lower-status contributors trigger attacks forward; yet, it is the lower-status contributors who also come forward to defend third parties. The method we use can be applied to other large-scale temporal communication and collaboration networks to identify the existence of negative social interactions and other social processes. The article was published in Scientific Reports.